DTM Circuit Zolder is back in 2019, during the weekend of 17-19 May. In May, the DTM, one of the most important European race competitions, will return to Circuit Zolder. From 17 to 19 May, about 70,000 national and international DTM fans will gather at Zolder. The arrival of the DTM will have a gigantic impact on sports and tourism and is therefore wonderful news for our province, for Flanders and for Belgium as a whole. This is truly an exceptional moment given the fact that it has been 16 years since the DTM last took place at Circuit Zolder. With this event, we will make an irreversible statement: Limburg is no longer the slowest! In 2019, the DTM will be THE sporting event in Belgium! As such, it is the ideal occasion to invite your professional partners and stakeholders to this impressive race. DTM or the Deutsche Tourenwagen Masters is one of the most important and most significant Touring Car Championships in Europe. With its gigantic economic impact, it is wonderful news for both Circuit Zolder and our province. Touring cars are race cars based on an existing car type that is free for sale and is allowed to drive on public roads. Depending on the class in which a touring car races, many or little changes are allowed to the mechanical parts of the car. 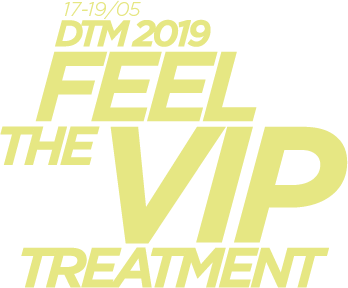 In this brochure, you will find more information about the various VIP formulas and VIP lodges during the DTM weekend that will take place from 17 to 19 May. join the party with DJ Bob Sinclar on Saturday 18th May.